Please support the Fallen Heroes educational film project. View the 3 minute trailer below. One of the most compelling stories of our modern times as Canadians took place throughout the war in Afghanistan. Most Canadians will remember the Highway of Heroes and the moving repatriation ceremonies as we paid somber tribute to each fallen Canadian soldier on their final journey home. The Highway of Heroes phenomenon was one that evolved naturally from our sense of collective shock and deep sadness for the young lives being lost in a dangerous war. It was a genuine and powerful gesture of a grateful nation to honour the sacrifices of our young men and women. This is an important story because the Ramp Ceremony and Highway of Heroes phenomenon precipitated an unprecedented outpouring of support from Canadians toward the Canadian Military and was a turning point in Canada's relationship with its Forces. These were ceremonies created by the people for the people and arose from a heartfelt need to pay fitting tribute to our fallen. This story touches every soldier, sailor and aviator, and their families, across the country and must be told. 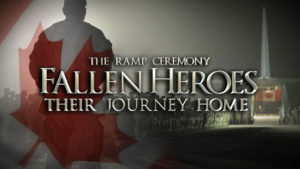 The Ramp Ceremony and the Highway of Heroes showed the world what Canadians are all about. It was the Canadian way. We would be grateful for any level of support that is meaningful for you.